I received a phone call in November 2014, from a guide in Reno, NV. His name is Doug Ouelette and he has been guiding over 30 years on Pyramid Lake for super big Cutthroat trout. One of my jigcustomers from California, John Cancilla, had just fished with Doug for 4 days. John had caught several nice fish but had also had 3 of those monsters straighten out hooks on my regular Zig Jigs. Doug was just opening up some jig heads he had bought from Cabelas and was fed up with inferior quality hooks. John had given Doug my number because he loved the way my jigs caught fish. Doug asked me if I could build my jigs with a super heavy hook so his customers would have a better chance of landing the huge fish they were hooking. That's when the process started. It has taken a year of doing prototypes and testing but we finally have our new line of Zig Jigs HD ready to go. These feature the same unique head that I've always used but the HD version has a black nickel Steelhead hook. As you can see form some of the pictures of Doug's clients with fish that they have caught, the new Zig Jig HD is working!! Even though these jigs were designed to handle the huge Pilot Peak strain and "Pyramid strain" of Lahontan strain cutththroats, they will work great in any situation where you know you will be catching bigger fish. These will work in many salt water applications along with freshwater fishing for bass, walleye, lake trout and other larger species. Click on the Pyramid lake page. These are the biggest cutthroat trout in the world. If you book a trip, with Doug, you will not be disappointed. Necessity is the mother of invention. In November of 2014 I received a call from Doug Ouelette. He had been guiding a client of mine on Pyramid Lake in Nevada. They had caught several fish but my customer, John Cancilla, from California, had a couple of different big fish straighten the hook out on some of my regular White River Zig Jigs. John told Doug he should give me a call and see if I could build a jig with a better hook. Doug had just purchased a package of jig heads from a major sporting good retailer and was complaining about the terrible hooks. I told him I would look into it. Well, after a year, the time has come and the Zig Jig HD (Heavy Duty) is born. We used the same unique head design as on the regular jigs but we used a black nickel steelhead hook in the HD version. These are without a doubt, the marabou jig with the strongest hook you can buy. I had some prototypes done and met John in Reno, NV in April. We fished with Doug for 4 days to test the hooks to make sure they held up under the pressure of those monster cutthroat that swim in Pyramid Lake. The results were great. Some of the pictures you see on this page were fish that either John or I caught on that trip. 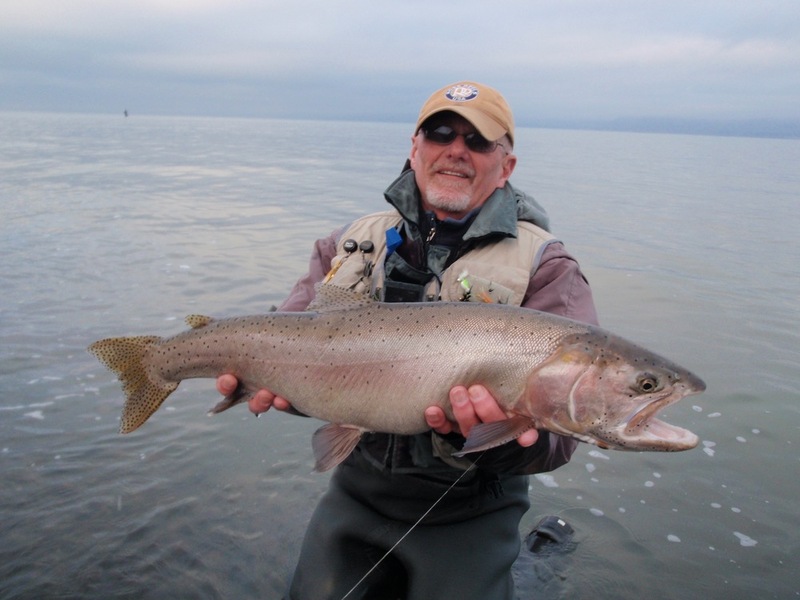 Pyramid Lake is truly the “Land of the Giants” and home to the world’s largest Cutthroat Trout. If you fish in lakes and rivers where you know that you’re going to hook big fish like trout, steelhead, smallmouth, walleye, largemouth or lake trout, you now have a weapon available to you that will allow you to not only hook those larger fish, but to LAND them as well. I have some customers that use my Zig Jigs in salt water too. The new Zig Jig HD will be a great option for them too. We all know how hard those salt water fish fight! Pyramid Strain of Lahontan Cutthroat Trout 15 lbs.